A performance by jazz saxophonist Steve Buckley is among the highlights of the second University of Plymouth Music Week, presented by Peninsula Arts. The Loose Tubes sax player features as part of a packed programme of free, public events, from Tuesday 8 May to Saturday 12 May, in venues across the University’s city centre campus. With gigs at lunchtime and in the evening, and everything from big band swing to Balinese gamelan, the week showcases the diverse interests of staff and the range of styles that form part of the University’s Music degree programme. The majority of performers are academics, or students from the course and University ensembles. Two of these ensembles open the week with a bang, when the Gospel Choir and the Big Band take the stage in The House. The following evening sees improvised music with jazz roots from Steve Buckley, who shot to fame as a leading member of Loose Tubes, the 21-piece group that became the focal point of the British jazz renaissance of the 1980s. Steve is an occasional saxophone teacher at the University. There will also be a late evening premiere performance of Empty Moments, a series of piano miniatures composed and played by part-time Lecturer and Music Week organiser Sam Richards. The University has a full set of Balinese gamelan instruments, and tutor Saj Collyer makes frequent trips to Indonesia to further her knowledge of this extraordinary musical tradition. 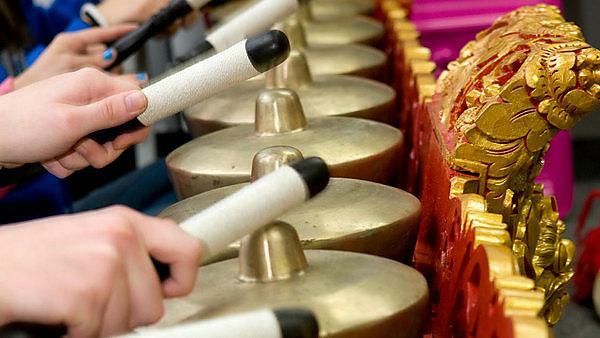 She will direct a group of students who will fill the Roland Levinsky Building’s Crosspoint with the striking sound of a gamelan orchestra during lunchtime on Thursday 10 May. That evening will be given over to electro-acoustic compositions by Lecturers David Bessell, Mike McInerney, David Strang and Marcelo Gimenez of the Interdisciplinary Centre for Computer Music Research (ICCMR). Friday lunchtime will see a performance of piano music by Philip Glass played by part-time Lecturer Lona Kozik, followed that evening by student performances of jazz, blues and improvisation. Music Week will end with student hard-rock band Capulus performing in the Students’ Union bar on Saturday night. All Music Week events are free and open to everyone. Booking is advised, and places can be booked in advance for all except the gamelan performance and the Capulus gig. Join a community that combines world-leading research in computer music and its applications, with a range of taught courses. Our exciting degrees encompass performance, composition, arrangement, recording, psychology, and the contextual study of a wide range of styles.